i really, really love confetti. like.. a lot. the above photo was taken at a job i had a few years ago, when we were filming a quick video… a clown was involved. and a bounce house. we were all standing around at the end of the day, surveying the confetti explosion that had happened, and i sort of… jumped into it. with the office dog. for no reason. aaanywho, here are some of my favorite confetti-inspired things – they’re just as festive as the real deal, minus the pesky clean-up process. 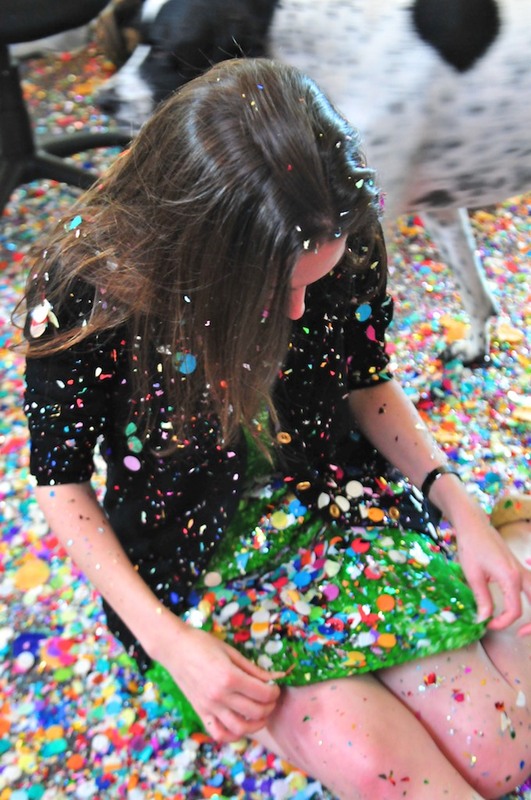 who says confetti is just for parties? whether it’s sprinkled on your nails, dusted across your tee or spritzed on your way out the door, it’s bound to add some charm to your day… garland, confetti system. tee, madewell. sweater, zadig & voltaire. earrings, style tryst. pillow cover, west elm. heart pin, ban.do (also featured here). heels and ‘twirl’ fragrance, kate spade. nail polish, sephora by opi. « let’s talk about… socks! You are currently reading confetti love at hello lisanne.